Buddhaghosa offering the Visuddhimagga to the chief monk. Bhadantācariya Buddhaghosa was a fifth-century Indian Theravadin Buddhist commentator and scholar. His name means "Voice of the Buddha" in the Pāli language. His best-known work is the Visuddhimagga, or Path of Purification, a comprehensive summary and analysis of the Theravada understanding of the Buddha's path to liberation. The interpretations provided by Buddhaghosa have generally constituted the orthodox understanding of Theravada scriptures since at least the twelfth century C.E. He is generally recognized by both Western scholars and Theravadins as the most important commentator of the Theravada. Limited reliable information is available about the life of Buddhaghosa. Three primary sources of information exist: 1) short prologues and epilogues attached to Buddhaghosa's works, 2) details of his life recorded in the Mahavamsa, a Sri Lankan chronicle, and 3) a later biographical work called the Buddhaghosuppatti. A few other sources discuss the life of Buddhaghosa, but do not appear to add any reliable material. The biographical excerpts attached to works attributed to Buddhaghosa reveal relatively few details of his life, but were presumably added at the time of his actual composition. Largely identical in form, these short excerpts describe Buddhaghosa as having come to Sri Lanka from India, and settled in Anuradhapura. Besides this information, they provide only short lists of teachers, supporters, and associates of Buddhaghosa, whose names are not generally to be found elsewhere for comparison. The Mahavamsa records that Buddhaghosa was born into a Brahmin family in the kingdom of Magadhi. He is said to have been born near Bodh Gaya, and to have been a master of the Vedas, traveling through India engaging in philosophical debates. Only upon encountering a Buddhist monk named Revata was Buddhaghosa bested in debate, first being defeated in a dispute over the meaning of a Vedic doctrine, and then being confounded by the presentation of a teaching from the Abhidharma. Impressed, Buddhaghosa became a Buddhist monk and undertook the study of the Tripitaka and its commentaries. On finding a text for which the commentary had been lost in India, Buddhaghosa determined to travel to Sri Lanka to study a Sinhalese commentary on this text that was believed to have been preserved. In Sri Lanka, Buddhaghosa began to study what was apparently a very large volume of commentarial texts that had been assembled and preserved by the monks of the Mahavihara. Buddhaghosa sought permission to synthesize the assembled Sinhalese-language commentaries into a comprehensive single commentary composed in the Pali language. The elder monks sought to first test Buddhaghosa's knowledge, by assigning him the task of elaborating the doctrine regarding two verses of the sutras; Buddhaghosa replied by composing the Visuddhimagga. His abilities were further tested when deities intervened and hid the text of his book, twice forcing him to recreate it from scratch. When the three texts were found to completely summarize all of the Tripitaka and match in every respect, the monks acceded to his request and provided Buddhaghosa with the full body of their commentaries. Buddhaghosa would go on to write commentaries on most of the other major books of the Pali Canon, with his works becoming the definitive Theravadin interpretation of the scriptures. Having synthesized or translated the whole of the Sinhalese commentary preserved at the Mahavihara, Buddhaghosa reportedly returned to India, making a pilgrimage to Bodh Gaya to pay his respects to the bodhi tree. The details of the Mahavamsa account cannot readily be verified; while it is generally regarded by Western scholars as having been embellished with legendary events (such as the hiding of Buddhaghosa's text by the gods), in the absence of contradictory evidence it is assumed to be generally accurate. While the Mahavamsa claims that Buddhaghosa was born in northern India near Bodh Gaya, the epilogues to his commentaries make reference to only one location in India as being a place of at least temporary residence: Kanci in southern India. Some scholars thus conclude (among them Oskar von Hinüber and A.P. Buddhadatta) that Buddhaghosa was actually born in southern India, and was relocated in later biographies to give him closer ties to the region of the Buddha. The Buddhaghosuppatti, a later biographical text, is generally regarded by Western scholars as being legend rather than history. It adds to the Mahavamsa tale certain details, such as the identity of Buddhaghosa's parents and his village, as well as several dramatic episodes, such as the conversion of Buddhaghosa's father and Buddhaghosa's role in deciding a legal case. It also explains the eventual loss of the Sinhalese originals from which Buddhaghosa worked in creating his Pali commentaries by claiming that Buddhaghosa collected and burnt the original manuscripts once his work was completed. 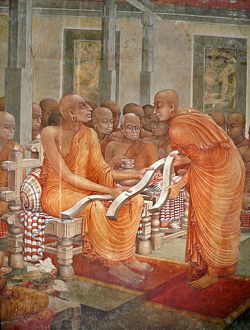 In the twelfth century, the Sri Lankan monk Sariputta became the leading scholar of the Theravada following the reunification of the Sri Lankan monastic community by King Parakramabahu I. Sariputta incorporated many of the works of Buddhaghosa into his own interpretations. In subsequent years, many monks from Theravada traditions in Southeast Asia sought ordination or re-ordination in Sri Lanka because of the reputation of the Sri Lankan Mahavihara lineage for doctrinal purity and scholarship. The result was the spread of the teachings of the Mahavihara tradition, and thus Buddhaghosa, throughout the Theravada world. Buddhaghosa's commentaries thereby became the standard method by which the Theravada scriptures were understood, establishing Buddhaghosa as the definitive interpreter of Theravada doctrine. Finally, Buddhaghosa's works likely played a significant role in the revival and preservation of the Pali language as the scriptural language of the Theravada, and as a lingua franca in the exchange of ideas, texts, and scholars between Sri Lanka and the Theravada countries of mainland Southeast Asia. The development of new analyses of Theravada doctrine, both in Pali and Sinhalese, seems to have dried up prior to Buddhaghosa's emergence in Sri Lanka. In India, new schools of Buddhist philosophy (such as the Mahayana) were emerging, many of them making use of classical Sanskrit both as a scriptural language and as a language of philosophical discourse. The monks of the Mahavihara may have attempted to counter the growth of such schools by re-emphasizing the study and composition in Pali, along with the study of previously dis-used secondary sources that may have vanished in India, as evidenced by the Mahavamsa. Early indications of this resurgence in the use of Pali as a literary language may be visible in the composition of the Dipavamsa and the Vimuttimagga, both dating to shortly before Buddhaghosa's arrival in Sri Lanka. The addition of Buddhaghosa's works—which combined the pedigree of the oldest Sinhalese commentaries with the use of Pali, a language shared by all of the Theravada learning centers of the time—provided a significant boost to the revitalization of the Pali language and the Theravada intellectual tradition, possibly aiding the Theravada school in surviving the challenge to its position posed by emerging Buddhist schools of mainland India. ↑ Hinüber, Oskar, 1996: 103 is more specific, estimating dates for Buddhaghosa of 370 - 450 C.E. based on the Mahavamsa and other sources. Following the Mahavamsa, Bhikkhu Ñāṇamoli, 1999: p=xxvi places Buddhaghosa's arrival as coming during the reign of King Mahanama, between 412 and 434 C.E. ↑ Table based on Bullitt, 2002. Bullitt, John T. 2002. Beyond the Tipitaka: A Field Guide to Post-canonical Pali Literature Retrieved March 12, 2008. This page was last modified on 4 July 2008, at 18:41.